We need to roast the peanuts and remove their skins. Take the peanuts on to a paper plate and place this plate in a microwave oven. Roast the peanuts on high power for one minute. Allow half a minute standing time before removing the nuts from oven. To remove the skins of the nuts, cool them till warm and rub between your palms. Another method is, take the roasted peanuts in a cloth. Bring all the edges of the cloth together and make a pouch. Rub on the pouch with the palm so that the skins peel off from the nuts. One more easy method to remove the skins of roasted nuts is, hold the pouch tight and beat it on the kitchen platform from all sides. After few minutes of beating, open the pouch and see that the skins are separated from the peanuts. Remove the skins and keep the roasted peanuts aside. Invert a steel tumbler and apply ghee on the outer side of the base. Take a square cake tin and an aluminum foil of the tin size. Apply ghee inside the cake tin all over and place the aluminum foil in the base of the cake tin. Apply ghee on the aluminum foil also and keep this aside. Take water in a plate and keep it near the stove. Heat a pan on low flame and add water to it. Add grated jaggery to the water and mix. Heat another pan on medium heat and add powdered sugar to it and keep on stirring it. After some time observe that the jaggery is boiling. Stir the jaggery mixture in between and cook on low flame only. Meanwhile observe that the powdered sugar has also started melting. Lower the heat of the pan in which we are caramelizing the sugar. Allow the powdered sugar to melt till it caramelizes and changes to a nice golden brown color. Once it attains golden brown color remove from heat. At this stage drop some caramelized syrup in cold water and see that it crystallizes immediately. The syrup dropped in water becomes hard. If you notice the temperature on candy thermometer it should be between 150oC and 160oC. Further heating the sugar gets a burnt smell with a dark brown color. Keep this caramelized sugar pan away from the stove and keep stirring it in between. Now observe that the jaggery syrup has also thickened. Drop some jaggery syrup in cold water and see that it has reached soft ball consistency. The temperature on candy thermometer at this stage should be 120oC. At this temperature cook the jaggery syrup for 2 minutes. Add the caramelized sugar in the jaggery syrup and immediately add the roasted peanuts. Mix all well till nuts are coated with the syrup mixture. Pour this mixture in the prepared cake tin and spread it evenly. At this stage work fast otherwise the syrup thickens and the whole thing will be unmanageable. 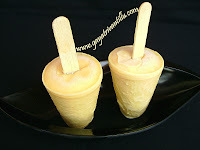 Press the mixture with the ghee smeared tumbler to get evenness in thickness. Let it cool for 3 to 4 minutes and mark it with a flat ladle or a knife while still warm. Once the mixture cools, it hardens. So mark the chikki while the mixture is still warm. Keep this cake tin aside and cool completely. When the mixture has completely cooled down, turn it on to a plate. Remove the aluminum foil and break it along the marks to get nice square pieces of chikki. Take a piece of chikki in hand and see how brittle it is. Enjoy serving this tasty chikki to your family members or guests. Take good quality peanuts. Similarly take jaggery which is clean from dirt. Here it took one minute for me to roast the peanuts. However the roasting time may differ from one microwave oven to the other. If the nuts crack and split and a nut rubbed between fingers removes the skin easily then the nuts are roasted. Take them into a cloth and beat them as mentioned in the recipe to remove the husks. Another method is to wait till the nuts are warm to touch and then rub them between both the palms to remove the husks. Apply ghee to the cake tin and then place the foil in it so that it sticks to the bottom of the pan, before we pour the mixture into it. Using aluminum foil helps the chikki come out with ease from the pan. Melt the sugar till it caramelizes to a nice golden color. With the heat in it the caramelized sugar will further change its color even when removed from the flame. So be alert while caramelizing sugar otherwise, the sugar gets a burnt smell with a dark brown color which spoils the entire taste. Similarly cook the jaggery till it reaches soft ball stage. After adding the caramelized sugar, the jaggery syrup thickens. So keep the sugar syrup and roasted peanuts near and add immediately one after the other. 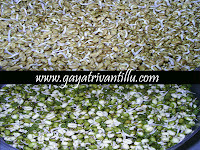 For different nuts and seeds different procedures are to be followed even if the ingredients are same. Take for example, cashewnut chikki (JEEDIPAPPU PAAKAM)—it has to be prepared with jaggery only to get the right taste. Sesame chikki, peanut chikki, puffed rice chikki etc.-all have the same ingredients but procedures differ to get the right taste. If you make the Groundnut chikki with jaggery alone the texture will be different. The chikki breaks easily and won’t be brittle at all. If you make the chikki with sugar the texture will be different. The chikki will be brittle and gives it a perfect shape. But it will not have the sweet taste which the jaggery chikki has. If you make the chikki with jaggery and sugar then the chikki will be sweet to taste as that of a jagggery chikki and is also be brittle as that of a sugar chikki. Sugar caramelizes and makes the chikki brittle. However caramelized sugar loses its sweetness. So make a chikki with jaggery and sugar and enjoy the taste and brittleness. In some chikkis like the famous LONAVALA CHIKKI, liquid glucose is used to thicken the syrup. But prepare the chikki as shown here, without using any liquid glucose and it will remind you of the tasty LONAVALA CHIKKI. This I can tell with confidence as I have tried all the methods. Not only children but people of all ages like this tasty chikki. do you have any such programmes. Your website is great... I also passed out from Reddy college in 1987 - B.Sc (Maths). Which group were you from? I am presently working in USA. Can you email me the recipe for bellam kaju/ ground nut chikki with jaggery??? My groundnut chikki comes out very sticky and difficult to eat. TIP: In all your recipes you mention the salt as required for taste. Instead please mention the actual quantity required / or to taste. Since the videos are all done, you can mention it in the recipe. I always have a problem in judging the salt. Thanks for your feedback. I had Maths, Physics and Chemistry in my BSc. I passed out in 1987 from Reddy college in Narayanguda, Hyderabad. I am not able to place you and its rattling in my mind for the past 24 hours. Would you mind sending your photographs of then and now!!! If I guess you were a non-telugu interested more in maths, wearing spects, attried mostly in Punjabi suits and preferring to speak only in English ............!!!! You only have to solve the riddle. As a science student I used to feel that Salt is Salt, whether in Tamilnadu or Kashmir. But now in India I find so many brands of salts. In order to make it free flowing, companies are adding additional chemicals while packaging salt. Surprisingly other ingredients like chilli powder etc are now less variable compared to salt. Thus I am suggesting "Salt to Taste"
nenu meeru chupinchina chikki try chesanu taste bagane vachindi kani thineppudu panti ki koddiga attukuntundi 2 times alane vachindi. please suggest me some tips to overcome it. The stickiness depends upon the art of determining the exact "Paakam", which is almost impossible to show or narrate. Only your trials would make you perfect that art. It happened to me also quite a few times initially. peanut chutney is missing/i couldnt find it, thank you for the wonderful website. I went through your site. Its just amazing. All the receipes are like the way my mother taught me. I tried out the Chikki, it came out nice. All these years i have been buying. Thanks a lot for this lovely recipe. I didnot find Jantikalu and chagodilu. Please do post them. Chikki try cheysanu and chala chala baga vachindhi. Me vantalu perfect andi. I have tried lot other recepies from your site and everything was awesome. meru cheyppina measurements follow ithey vanta taste superb ga vasthundhi. Frankly speaking this is the very first time i have spent some couple of minutes to write comment and it really worth. I wish you all the best andi.Me enti vantalu ma enti vantalu i poyaye. Thank you so much once again andi. i made peanut chikki from ur recipe and that was very good thanx i like very much ur site. 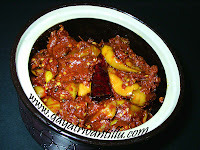 It would be most welcome if you were to post the recipe for an amazingly tasty Andhra dish...."PATHOLI"! google lo coriender rice search chestu unte ee web site chusanu...WOW super ga undi andi..nejamga chala chala bagundi.